Bread has deep roots in the fabric of our lives. It means comfort and sustenance at a basic level. Even in today’s “I don’t eat bread” low-carb world, people are still searching for the best bread recipes. I remember starting on my baking journey with muffins and quick breads that were so good fresh from the oven (well, actually it started with cookies, but that’s a whole other thing!). But I soon wanted to make my own real bread, if you know what I mean. Over the years since, I have made many loaves, rounds, rolls, and even bagels, along with more sweet breads like cinnamon rolls, scones, and batter breads in my search for good bread recipes. Most were wonderful, some were just okay – and some were terrible. 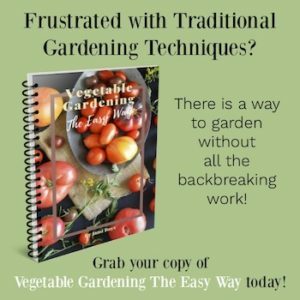 But they all helped me develop easy recipes that actually worked for my real-life family – one with jobs, school, and responsibilities outside of the kitchen. I was able to stop buying sandwich bread from the store and $5 loaves of artisan bread became a thing of the past (flour + water + yeast + salt = pennies, how did loaves get to be so much?). My extended family requested my cinnamon rolls every year for the holidays. I became a bread baker. And you can become a bread baker, too, with these bread recipes that anyone can make. 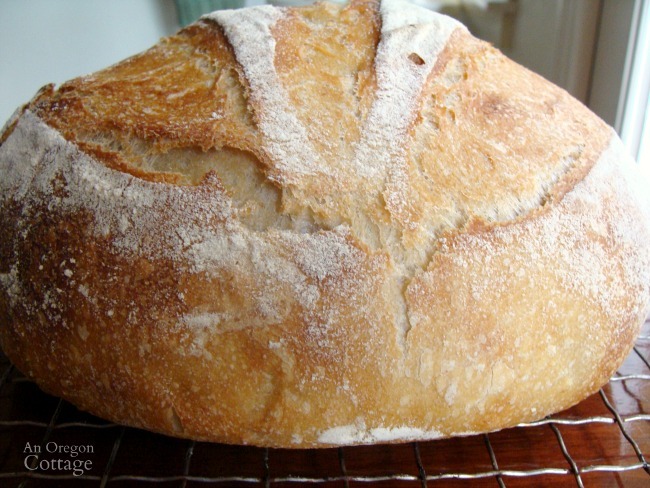 Yeast, sourdough, and quick breads – both savory and sweet – whatever you’d like to make, there’s a recipe here that will help you become a bread baker, too. 1. 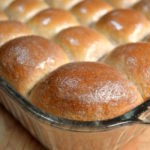 The Original Soft 100% Whole Wheat Dinner Rolls Recipe – the recipe that proved that bread, rolls, etc. made with whole wheat bread could really be soft and delicious. 2. Easy, Soft 100% Whole Wheat Sandwich Bread Tutorial – once I knew that wonderful rolls could be made with 100% whole wheat, a sandwich bread was the next on the list. This recipe delivers a soft loaf with just a 15 minute sponge and one rise! 3. Easy Artisan Bread Recipe – no kneading, very little hands-on time, and a baking technique that results in that great artisan crunchy crust. 4. Homemade Whole Grain Pita Bread – this is so fun to make and watch the little pillows billow in the short, hot oven time. 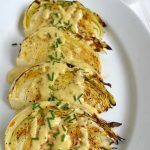 Mainly, though, you’ll want to make these because they are SO much more tender and flavorful than store-bought. 5. Amazing 100% Whole Wheat Flaky Homemade Biscuits – another recipe that is soft and flaky with whole wheat, though in this case it’s whole wheat pastry flour. I share the easy technique for getting those layers are illustrated, too. This is a great introduction to breads, since they are baking powder risen and ready to eat in just minutes instead of hours. 6. Easy No Knead, No Rise Soft Pretzels – kid friendly, no rising or kneading, this recipe will make you popular with your kids friends and nieces and nephews! 7. Simple French Baguettes Recipe – our family has named this “the bread you can’t stop eating” which pretty much says it all. Oh, maybe not all – how about the fact that you make it in a food processor? So easy. 8. Quick & Tender Homemade Hamburger Buns or Breadsticks – this is the perfect hamburger bun recipe that turns out tender every time, with the bonus of being super quick even though they’re made with yeast, whether you decide on buns or breadsticks. 9. Soft & Easy 10 Grain Sandwich Bread – add more grain variety to your sandwich bread with this easy loaf bread. 10. Easy Pesto Twist Bread Recipe – using the quick homemade pizza dough and our stash of frozen pesto makes an easy skillet bread you can even make on weeknights. 11. Quick Homemade Pizza Dough – for less than $1.00, and just a few minutes you can have a delicious pizza dough perfect for family pizza nights. 12. Rich Cornbread with Honey Butter – not your average cornbread, this is soft and tender with a honey butter that elevates it to another level. 1. 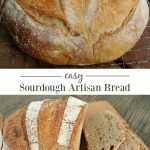 Easy Sourdough Artisan Bread – adapted from my easy artisan bread, this uses a strong sourdough starter to give it a nice tang. 2. Easy Homemade Whole Wheat Sourdough English Muffins – perfect for when your starter is new or growing again – homemade English muffins are surprisingly easy! 3. Homemade Sourdough Bagels – complete with a step-by-step tutorial, this is another good way to use a newer or growing starter. 4. 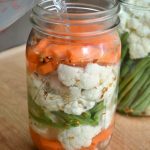 How To Grow, Keep, & Use A Sourdough Starter – not a bread recipe, but helpful tips for growing and storing sourdough so that you can make wonderful fermented bread recipes. 1. 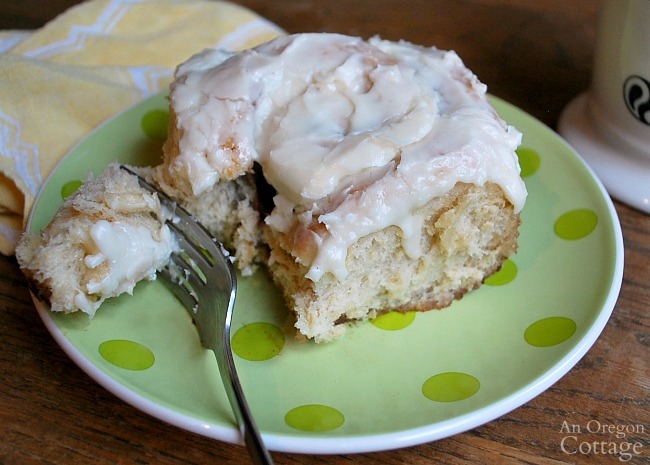 The BEST Cinnamon Rolls – really. Be prepared to make them for every family gathering after making them once. 2. Overnight Make Ahead Monkey Bread Using Real Ingredients – fresh balls of cinnamon glazed dough fresh from the oven in the morning – this is our Christmas morning tradition. 3. Healthy, Whole Wheat No Fail Zucchini Bread – our go-to zucchini bread that turns out perfect every time. One of my favorite ways to freeze zucchini is in this bread! 4. Make Ahead Zucchini Cinnamon Freezer Muffins – my other favorite way to preserve garden zucchini is using it in these muffins that you freeze before baking. How about fresh zucchini muffins whenever you want? Um, yes! 5. Dark Chocolate Zucchini Bread Sweetened with Honey – when you’re craving chocolate, this bread is a little bit healthy while still being c.h.o.c.o.l.a.t.e. 6. Glazed Zucchini Lemon Bread – a refreshing take on zucchini bread with lemon flavor in the bread and in the glaze. 7. Glazed Orange Rhubarb Muffins – these muffins are a perfect way to use diced rhubarb – the orange and rhubarb are such a great flavor combination. 8. Starbucks-Inspired Frosted Maple-Oat Scones – after having one of these with my coffee, I just had to go home and recreate them – maple and oatmeal are so lovely together! 9. Honey Sweetened Oat Whole Wheat Blackberry Muffins – use fresh or frozen blackberries in these healthy muffins sweetened only with honey. 10. Honey Sweetened Lemon Flaxseed Muffins (Gluten-Free) – another healthy muffin for those lemon cravings. 11. Double Apple Scones with Caramel Glaze – this is a fall tradition for our family! 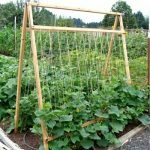 It uses applesauce and grated apples for moisture and flavor – and you may find yourself wanting to caramel glaze everything. 12. Cranberry Crumb Loaves or Muffins Recipe – the perfect recipe to use with fresh cranberries or even leftover cranberry sauce! 13. 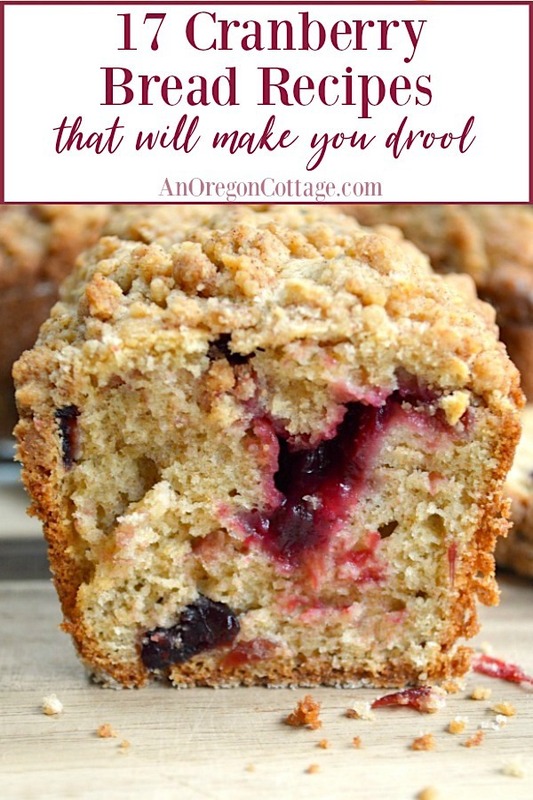 Make Ahead 10 Grain Berry and Nut Freezer Muffins – another great muffin you can freeze before baking to have fresh-from-the-oven muffins whenever you want. No 10-grain cereal on hand? Use steel cut oats or even whole oats instead. 14. Orange Zucchini Bread Recipe – this quick loaf is made with whole wheat and sweetened only with orange juice and honey, making it a great option for healthy snacks and breakfast. 15. Coconut Bread Recipe – a delicious, moist snack and dessert bread made healthier with whole wheat and sweetened with maple syrup, this bread is also dairy free. 16. Garlic Cheese Zucchini Bread (100% Whole Wheat) – the perfect alternative to sweet zucchini breads, equally good warm from the oven served with soup and toasted and topped with tomato. Choose to make in a loaf or as 12 muffins. 17. Orange Cranberry Bread Recipe – this is a tried-and-true recipe from my college days that I’ve updated through the years to use less sugar and whole wheat. 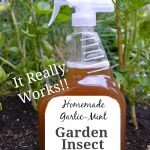 This is one of those recipes you forget how good it is until you make it again – everyone loves this! 18. Spiced Carrot Bread Recipe – this is literally like having your cake and eating it, too – a bread reminiscent of carrot cake, complete with a cream cheese glaze, but made with whole wheat and sweetened only with maple syrup – even the glaze. SO good. 1. 17 Fabulous Cranberry Bread Recipes (Including Yeast, Gluten Free, and Paleo) – this was such an eye-opening list to research – I had no idea there were so many unique ways to use cranberries in breads! No matter what kind of cranberry bread you’re searching for, there is something for you on this list. 2. 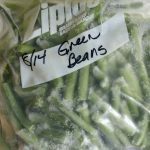 Bread Recipes without Eggs – if you’re avoiding eggs, this is where you can find all my eggless recipes, plus more I rounded up. Everything from sandwich bread to quick bread is covered here. 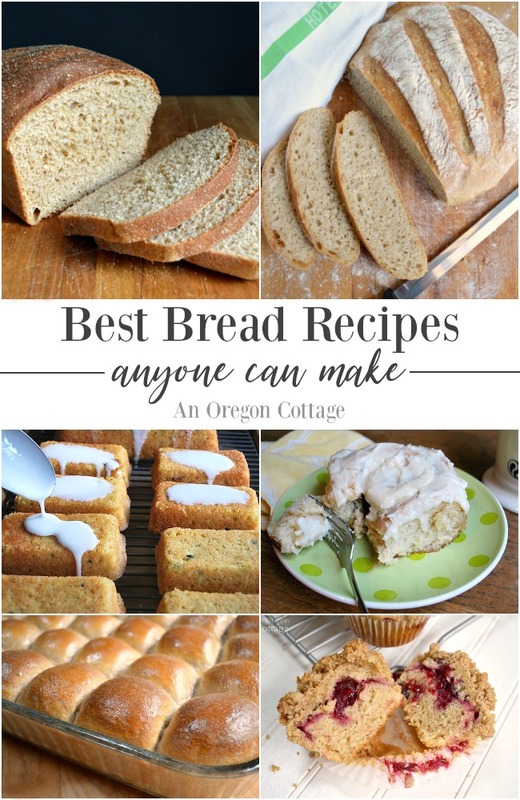 Be sure to let me know if you make any of these best bread recipes – one of my greatest pleasures is knowing I’ve helped someone on their journey to becoming a bread baker! 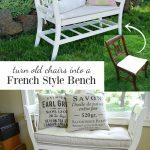 Follow me on Instagram and tag #anoregoncottage if you’ve made a recipe. Go here for even more easy & doable baking recipes. 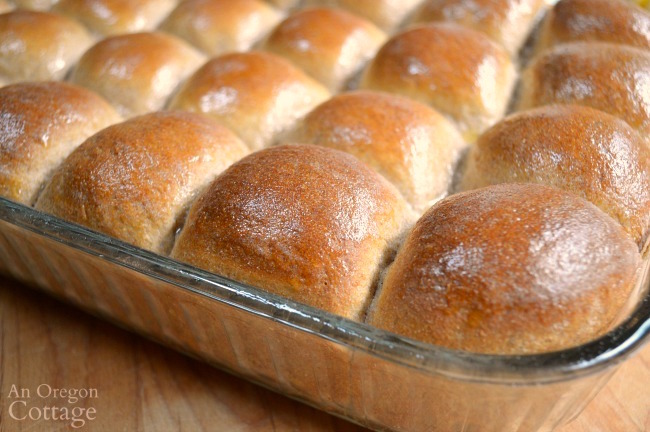 Hi Jami, thank you for posting (the recipe and video) of the whole wheat dinner rolls. Using your recipe and instructions made it a success for me. I’m looking for an Ezekiel’s Bread recipe. If you have one, that would be great.